In 1985 I enrolled at William & Mary. I remember bits of that summer day in which my mother and I made the journey from our home in Albemarle County (west of Charlottesville) to college in Williamsburg. That seems a long time ago. 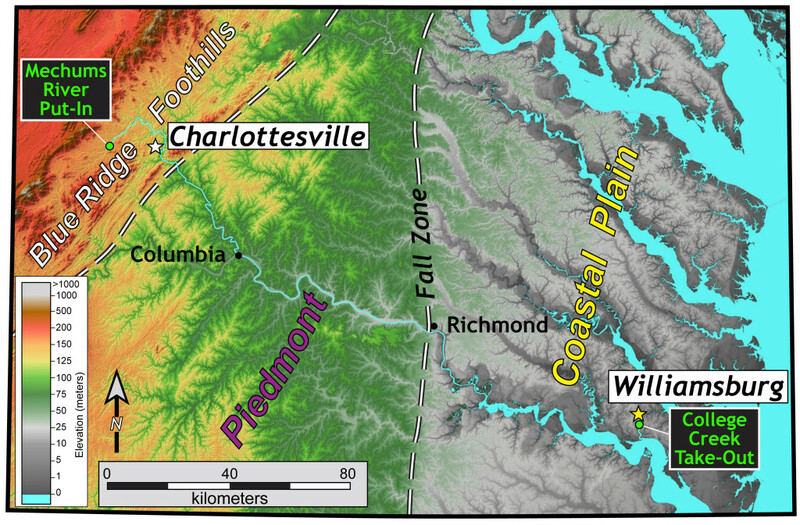 During the past thirty years I have made the journey from Albemarle County to Williamsburg (and vice versa) hundreds of times- I’ve gone by car, by truck, and many times in the Geology Department van on class and research field trips. I’ve gone by bus, by train, and by air- in a single engine Cessna. There have even been a few occasions where I’ve made the trip on my bike. But I’ve never made the journey by water, so in the summer of 2015- for a little adventure and to mark the 30th anniversary of my arrival in Williamsburg- I figured I’d paddle a canoe from the old stomping ground in Albemarle County to Williamsburg. Shaded relief map of the 2015 river trip route from Albemarle County to Williamsburg, Virginia. Note the distinctive topography in each province. Click on the map for a larger view. The journey will commence in the foothills of the Blue Ridge Mountains on the Mechums River, a small and sinuous stream, to the west of Charlottesville. I crossed this stream twice a day on my way to-and-from middle and high school. Some of my first float trips down the Mechums River were as a W&M undergraduate trying to find faults in the old Precambrian rocks, all part of my undergraduate thesis research. The Mechums joins the Moormans River, and together they become the South Fork of the Rivanna River. The Rivanna’s North Fork soon joins in, and the Rivanna flows southeast across the subdued landscape of the Piedmont. At Columbia, the Rivanna meets the James River, whose waters have traveled hundreds of miles from the Appalachian highlands. The James flows onto Richmond and the Fall Zone, where the stream drops a total of 30 meters (~100’) in rapid succession to sea level. Here the James becomes a tidal river and widens to immense size as it meanders across the Coastal Plain. East of Jamestown Island the route leaves the broad James, and the last 5 kilometers (3 mi.) will be up College Creek, the stream that drains William & Mary’s campus. The trip measures out at just over 300 kilometers (187 miles), and we’re aiming to cover that distance in 8 days on the water. Stream profile of the 2015 route from Albemarle County to Williamsburg, Virginia. The river gradient steepens dramatically in the Fall Zone (lots of rapids). 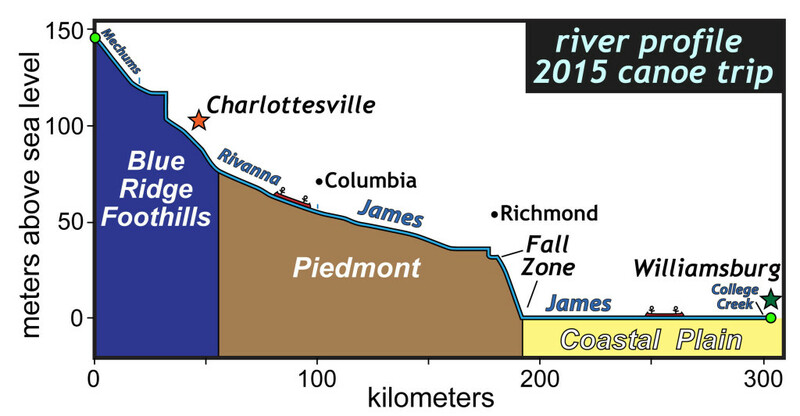 On the Coastal Plain, the James River is a tidal stream and at sea level. Note- the vertical steps in the profile are dams. W&M Geology alums Todd Beach and Scott Harris (class of ’88), in what might be a remarkable lapse of their normally excellent judgment, are joining me for the trip. We’ll also have a cast of other characters dropping in and out of the trip as we float from the foothills to the tidewater. I worry the little Mechums River will be full of snags and strainers, making downstream passage difficult. This July, thunderstorms seem to be a daily occurrence, and are a particular hazard on the water. There are a few dams to portage, Richmond’s noteworthy rapids to run, and more than one hundred kilometers (60 mi.) of a large estuary to transit in small canoes. It’s got all the makings of an excellent mid-summer escapade. Check back for the post-paddle update. I look forward to more updates. When you hit Richmond I’ll treat you to some cold drinks. 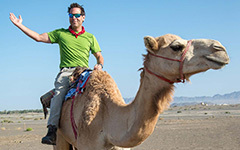 Sounds like an awesome trip – be safe and have a great time! What a great introduction, Chuck. I hope you guys have a grand adventure!